John Nutt helped design and analyse the sails of the iconic Sydney Opera House early in a career that saw him pioneer the use of computers in engineering, and contribute to the first fire code for buildings. In May 2014, a team led by PhD candidate Emily Petroff from Swinburne University was the first to see ‘fast radio bursts’ (FRBs) live, using the Parkes radio telescope in central New South Wales. The search was triggered by signals found in recycled data. They also discovered that someone was opening the kitchen microwave. Technology that ‘de-twinkles’ stars is being used to pinpoint manmade space junk and avoid devastating collisions like those dramatised in the movie Gravity. Australian company Electro Optic Systems, based on Mount Stromlo in Canberra, is using adaptive optics and pulsing lasers to locate detritus too small for conventional radar. Ultimately, the company hopes to use similar lasers to remove the debris from orbit. Adaptive optics helps the pulsing lasers to cut through the Earth’s atmospheric turbulence, which distorts and scatters light, by using a second orange-coloured laser to illuminate sodium atoms in the upper atmosphere. Fundamental questions about the Universe are set to be answered as a new radio telescope in outback Western Australia comes online, using multiple beam radio receiver technology to view the sky with unprecedented speed and sensitivity. The Australian SKA Pathfinder (ASKAP), CSIRO’s newest telescope, uses innovative phased array feed receivers, also known as ‘radio cameras’, to capture images of radio-emitting galaxies in an area about the size of the Southern Cross—far more than can be seen with a traditional radio telescope. Monster black holes lurking in the centres of galaxies are hungrier than previously thought, Melbourne scientists have discovered. Astrophysicist Alister Graham and his team at Swinburne University have revealed that these so-called supermassive black holes consume a greater portion of their galaxy’s mass the bigger the galaxy gets. The discovery overturns the longstanding belief that these supermassive black holes are always a constant 0.2 per cent of the mass of all the other stars in their galaxy. A new computer chip, which uses light instead of electronic signals to process information, could lead to high security, energy-efficient internet links more than 1,000 times faster than today’s networks. CSIRO’s Australian Square Kilometre Array Pathfinder (ASKAP) telescope is already booked out for much of its first five years of data gathering, even before it formally begins early operations in 2013. More than 400 astronomers from over a dozen nations have already signed up to look for pulsars, measure cosmic magnetic fields, and study millions of galaxies. 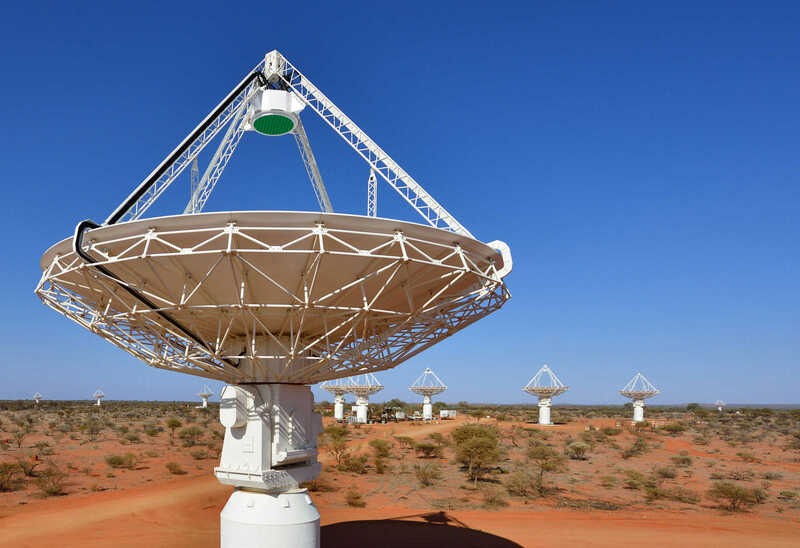 ASKAP was built at the specifically radio-quiet Murchison Radio-astronomy Observatory (MRO) in Western Australia as a technology demonstrator for the $2 billion Square Kilometre Array radio telescope.